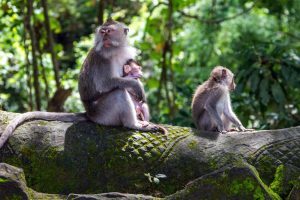 If you want to see some wildlife in Bali, your best bet is to visit the Monkey Park, where you can see grey haired macaques. You might also want to opt for one of the Bird parks or the Marine Turtle Center. There is also a Safari park, but while the place has noble intentions, it will not give an authentic experience as most of the animals are from other places and not endemic to Bali. The most popular park is the Ubud Monkey Forest, close to the town centre. The park’s official name is Mandala Wisata Wenara Wana, but it is also called the Sacred Monkey Forest. Not only does it house monkeys, but there are also three temples that were built by local villagers. Now for some rules. The monkeys might look cute, but it is better to keep your distance from them. They are extremely cheeky and they are clever, too. They know that most people will have something of interest to them in their backpacks, and they will often try to distract you while another monkey steals whatever is inside. They can also get quite aggressive when squabbling over food and can give you a nasty scratch. You can also go to the Alas Kedaton Monkey Forest or the Uluwatu Forest for a different experience. While feeding the animals might sound appealing, visitors should resist the urge to do so. Many vendors will try and sell visitors peanuts and bananas and while, on the surface, this might sound healthy, just imagine living on a diet of only that. Monkeys, like humans, are likely to take the easier option and if they eat only nuts and bananas, it disrupts their natural feeding cycle and can lead to them becoming obese and unhealthy. It is better to watch them from afar and to make sure that you have secured your bags.